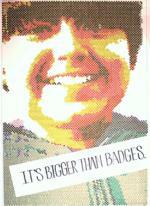 Northern Star Council had a facebook app created where you can take an image and recreate it with merit badges. See the promo video at YouTube. Make your own image at Badgetize Yourself on Facebook. I tried a few pictures, but didn't have much luck - please holler back here if you try it and like the results. I guess scouts leave a troop in one of three ways: age out, move away, or decide Scouting is not for them. I can remember the names of all the scouts that moved away in the past six years - Chris, Jack, Justin, Jack, Bill, and Adit. There aren't many of them. Three of them joined another troop. Two I never heard from again. And, we'll have to see what happens with the last one. An ASM stopped by this afternoon and grabbed the adult patrol box, tents, dutch ovens, ropes, and other gear from my garage for this weekend's campout. Since I'm presenting Scoutmaster Specific training tomorrow, I can't be two places at once so I'm missing camp tonight and tomorrow. I hope they aren't getting too wet. :-) This is the first campout I've missed in over a year, so it feels weird. But, after training tomorrow an ASM and I are driving to camp for dinner, campfire, and one night in tents and rain. Spent some time this afternoon reviewing the training materials and making the world's smallest candelabra for the 'Ceremony' part of the training. Got a handful of last minute phone calls from scouts asking about fuel, dutch ovens, pop-up shelters, and other easy stuff to pass them on to their patrol leader or quartermaster. 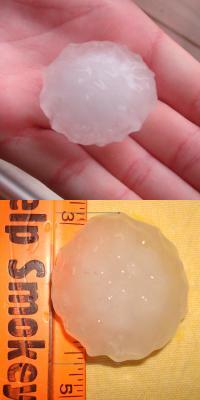 Here's what we had falling from the sky this evening! 1 3/4 inch hail, that's the biggest I've personally collected. Luckily, there wasn't much of it, around here anyway. But, they did let the sirens wail for awhile. I was inside having a scoutmaster conference at the time. If he is successful at his First Class cooking requirement this weekend, he'll have a board of review on Monday. He's been sitting at Second Class for awhile and has really matured since our last conference months ago. He's ready to take on more leadership in the troop. Also had the neighbor boy over for his Second Class conference this afternoon. It's rewarding to hear him tell about things he's learned over the past year in scouts and that he can hardly wait to do some high adventures. Lots of guys want to do cooking requirements for advancement on the upcoming campout. Problem is that many patrols only have a guy or two going so they're scrambling to gather together a 'patrol' to lead. I expect some will have to wait until next month. 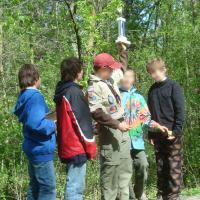 Getting the scouts outside sure makes for a more energetic troop meeting! The SPL had his plan all laid out with skills, patrol time, and troop game all outsite. The weather cooperated, and there was a lot of noisy activity so I'd say it was a success. Lots of scouts talked to me about pursusing the Cooking requirements for rank advancement this weekend. There should be some good meals prepared, I think. I'd just love some clear skies so First Class #1 can be done also - directions at day and night without a compass. This past week really got away from me and time to post was lost. Hopefully, it was a burp and not a lingering situation. I met a wonderful fella in the First Aid training that hiked almost all the Appalachian Trail a couple years ago. He and I talked for about 90 minutes about his trek. He has about 300 miles to go to finish it and hopes to get it done 'one of these days'. The Roundtable commissioner had his buddy give a presentation about his spelunking adventures - that's cave exploring. What an amazing story! About the most interesting talk at a roundtable meeting even though it wasn't very 'scouting-oriented'. He's been all over the world and has explored miles of virgin cave. Some of the photos were unbelievable. This was a VERY Scouty day for me. Got summer camp info together for the patrol leaders so each patrol can figure out their merit badges and activities at the PLC tomorrow. Attended the Court of Honor for three Eagle Scouts. The cake was great! Went on a 10-mile hike for the Hiking merit badge. At least the snow stopped from this morning. Snow on May 1st - sheesh! Oh, and gave away a Scout gift card in the monthly contest here.